Like most engineers, just the thought of spending three full days in meetings makes my skin crawl, but I was delighted to discover the keynote speaker was none other than Geoffrey Moore, author of Crossing the Chasm. Well, in the business world, Mr. Moore is somewhat of a legend. You see, his book Crossing the Chasm is considered to be the seminal text on shepherding a new product to mainstream success. I had actually read Mr. Moore’s book many years ago. Back then, I was a member of a fledgling startup software company, and our then-CEO handed out copies to all the early founders as required reading. I quickly devoured the text, and just as quickly forgot most of it as we went about the business of building our business. Can we apply the business principles of Crossing the Chasm to the business of writing, and more specifically, to the business of self-publishing? You see, as a newly self-published author, I tend to see everything though a writer’s prism these days. As I listened to Mr. Moore speak, it occurred to me that being a self-published author is not all that different than working for a startup company. As a self-published author, there’s a single employee (you), and it’s entirely up to that employee to bring his or her product (book) to the masses. You first have to develop your product (write your book), then figure out how to introduce that book to the mass market. Unfortunately, publishing is not a meritocracy: no matter how good your book might be, if the market doesn’t know it exists, it will languish in obscurity. Sure, you might pick up a handful of readers here and there, but how do you make the leap from undiscovered author to mainstream success? 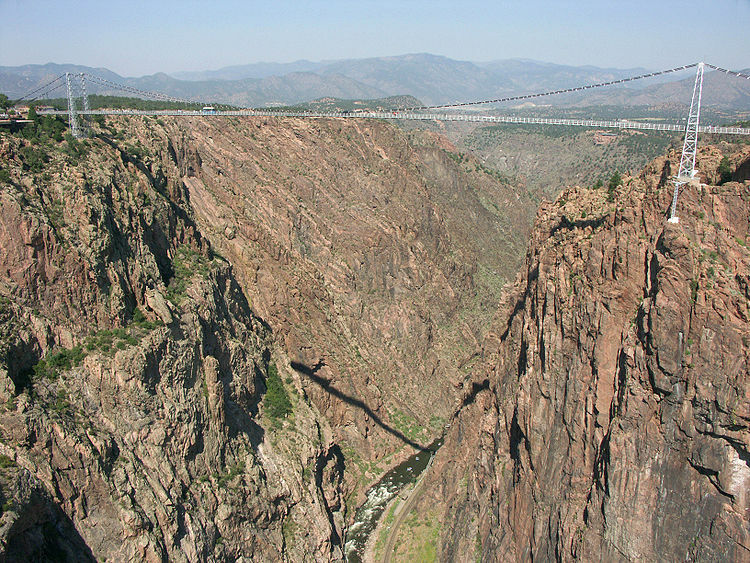 This is the much ballyhooed chasm I speak of, and making that leap is what Crossing the Chasm is all about. 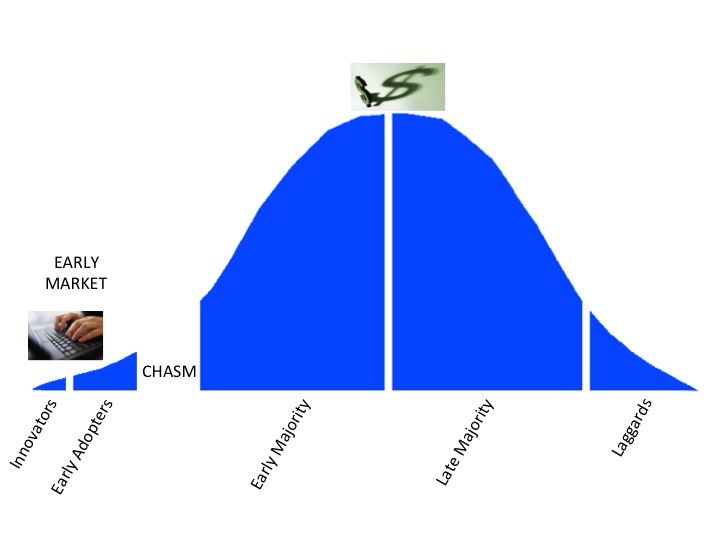 The above image depicts the product adoption curve from Crossing the Chasm. At the left end, the product has just been introduced. There are few users at this stage, and of these users, most are Innovators and Early Adopters (don’t worry; I’ll detail these user categories below). As the product gains more users, the Early Majority drives its popularity to an all-time high. Shortly after, the Late Majority jumps on the band wagon. Finally, as the product begins to wane in the marketplace, the Laggards bring up the tail end. So, who are all these people, and why should I care? 1. The Innovators – These are people who love to try out new products and services. They’re willing to take a risk on an untested product, and are more interested in the potential of a product than its current utility. These people get a charge out of working with the developers to make improvements and enhancements to the product. Oftentimes, they consider themselves a part of the development team. In the self-publishing world, these innovators would be your beta-readers. These are people who don’t mind that your book still needs a bit of polish. They get a thrill from assisting in the development process and watching the product go to market. You shouldn’t expect to make any money off these innovators. In fact, you’ll probably invest a good deal of your time (and possibly money) working with these innovators. The reward for them is satisfaction, and for you a better book. 2. The Early Adopters – These are the visionaries, people who see a product and imagine what it could do for them. They don’t rely on past success stories of other customers to make their decisions, but instead blaze a path into the unknown with eyes full of hope and optimism. These are the dreamers. In the self-publishing world, these would be the readers who are willing to buy a book from an unknown author, even if it has no reviews. They’ll read the product blurb, maybe sample a few pages, and throwing caution to the wind, click Buy. Obviously, if you’re just starting out as an author, these will be some of your most important customers. Early adopters sound great! So, what’s the catch? Well, first of all, there aren’t that many Early Adopters to begin with. If you look at the distribution curve, there are far less of them than mainstream users. What’s more, these Early Adopters are willing to help a new author, but they want something in return–namely, a discount. On the plus side, these Early Adopters like to feel personally involved in the development process. Maybe not in writing your book, but in helping you promote it. To this end, they’re willing to write reviews and spread word of your book to their friends, especially if they feel they’ve made a personal connection with the author. If one of these Early Adopters contacts you, be sure to write them back! 3. The Early Majority (Pragmatists) – Ah, now we’re getting into some big numbers! These are the users who will wait for a buzz to build about a product, then jump in early and enthusiastically. They’ll hold off purchasing until there are just enough positive reports from the Early Adopters to make success a probable event. These Early Majority users are not willing to risk a total flop, but they also don’t want to be late to the party. They are also more likely to pay full price than Early Adopters. In the publishing world, the Early Majority would be readers looking for the Next Big Thing. They’ll browse the digital shelves at Amazon, paying close attention to the “What’s Hot” categories. Furthermore, they’ll look for books that have been well-reviewed. If they decide the Next Big Thing is your book, hold on for a rocket ride! 4. The Late Majority (Conservatives) – These are the people who will wait for all the bugs to be worked out of a product. They don’t have any interest in being a beta site, and will happily wait for the Early Majority to fully vet a product. Only once they are satisfied that the risks are minimal will they make the leap. In the publishing world, these would be your best-seller readers. Less adventurous than the Early Majority, the Late Majority feel they have little time to waste sampling unknown books from unknown authors, and will gladly let the market determine their next purchases for them. Once the winners have been decided, then they’ll jump in. If the Late Majority are reading your books, pat yourself on the back. You have made it! 5. Laggards – These are your least adventurous buyers. They hate change, they hate new products, and they probably hate you, too. The only reason they are purchasing your product now is they have little-to-no choice, as their old product is now obsolete or non-functional. In the publishing world, these are readers who know what they like, and by God, they’re not changing now! They wouldn’t even bother buying new books except for the fact that their old books have already been “used up,” having been read one-too-many times. They’re likely to read books by the same authors they’ve been patronizing for decades (probably from that author’s back catalog), and would never pay full price for a book. If you manage to capture one of these readers, congratulations; you’ve probably had a long, successful career! Ok, so now that we’ve identified the different categories of users along the adoption curve, you might be noticing that large gap between the Early Adopters and the Early Majority. This is the chasm we’ve been discussing, and crossing it is the challenge of any successful product. If you do make it across, you will achieve a level of success most authors can only dream of, but if you fail, you will be banished to the Phantom Zone (not really, but it feels like it). Sounds daunting. How do we get there? This entry was posted in Writing and tagged fiction, literature, novel, self=publishing, writing, writing novel fiction. Bookmark the permalink.